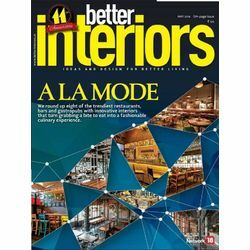 Better Interiors is aimed at the design conscious individual who wants to keep abreast of the latest and best in luxury interior design. Today Better Interiors is the preferred choice of home owners, design aficionados and enthusiasts. The magazines contents are all about luscious spaces that are lavishly presented accompanied with succinctly written details. Better Interiors tells you how your personal spaces can be stylish and yet easy-to-execute! The magazines columnists include experts in the field of architecture and colour who offer free, easy-to-use advice for readers.